Here are some facts about Loch Ness. Loch Ness is located in the Highlands of Scotland, a few miles southwest of Inverness. 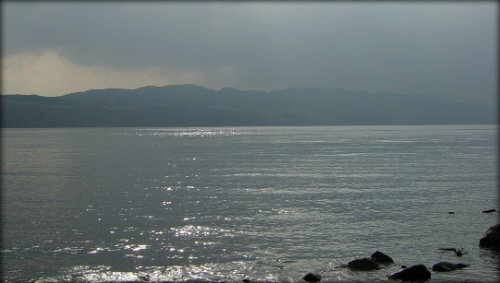 It is the second largest loch (lake) in Scotland with depths reaching over 750 feet. The loch contains more fresh water than all the lakes in England and Wales combined. It is 23 miles long and about a mile wide for most of its length. Loch Ness is part of the 60 mile Caledonian Canal, which connects Inverness to Fort William. The canal was constructed in the early 19th century and has 29 locks along its length. About 40 small rivers and streams run into the loch, and the water level in Loch Ness can be adjusted by several feet by the local power company, to prevent flooding. The waters of the loch never freeze over, and millions of peat particles floating in the water give the loch its darkish colour. Loch Ness is famous for its monster, known as Nessie, which has supposedly been sighted since the 6th century. In 1933, a man claimed the monster crossed the road in front of him – a sighting which led to increased interest. The first full scientific survey of Loch Ness was carried out in 1901. Since then, Nessie hunters have used underwater cameras, sonar, fish bait, and even submarines to try to locate the creature. The monster has appeared in hundreds of books, films and TV shows, becoming the most famous lake monster in the world. There is a Loch Ness monster roller-coaster ride in Busch Gardens in Virginia. There are two Loch Ness Monster visitor centres and museums. Another way to perhaps see Nessie is by taking a loch cruise or driving along the scenic A82 road. Some scientists think that a family of creatures might have become trapped in the loch at the end of the last ice age, about 10,000 years ago. Other theories suggest the monster is a huge slug or fish. What next? Discover some more facts about some of the world’s most famous rivers.